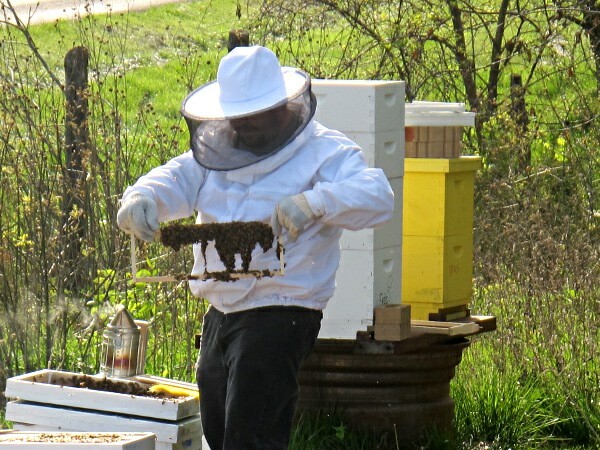 Previous 2012 installation post: #3: Intalling the 2012 Bees. We had considered releasing the queen the same day we installed the packages but hadn’t really made a decision. The rain on installation day decided for us. It turned out to be a quick & dirty, dump-the-bees-in thing. 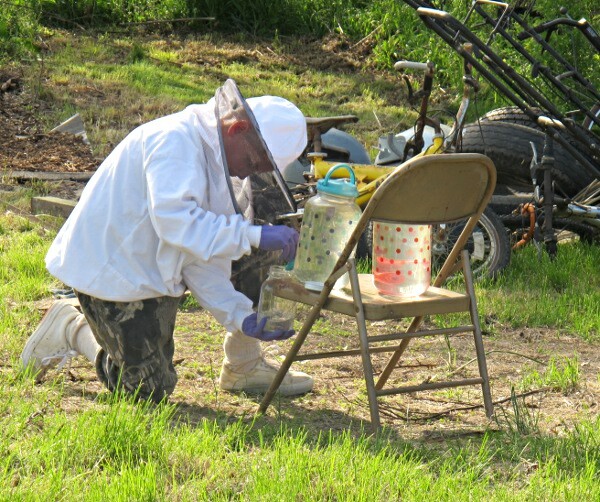 So a day or two later, the fellas went back through the new hives and released the queens. All went well and the bees had calmed down quite a bit. We got to see the bees doing their thing on the foundationless frames. All of their boardman feeders were empty so Charlie refilled them. I put syrup in sun tea jugs with spigots at the bottom for easy filling of the quart jars right at the hives. Worked great! 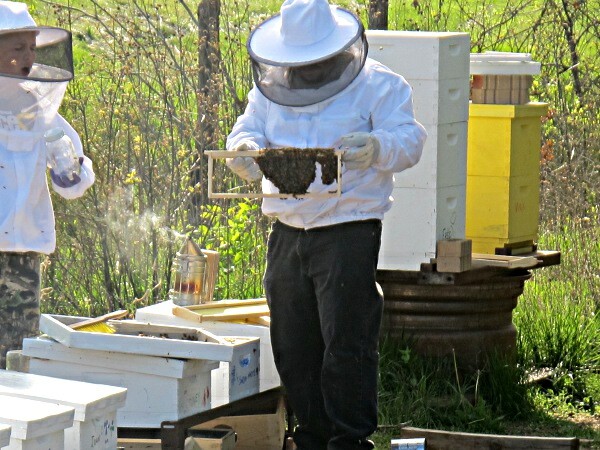 While they were there, they dove into Max, the Carniolan hive from last year. They’re still really small, maybe the size of an apple. I just don’t know what to think about these guys. They overwintered fine but they’re just not doing much. Maybe I’ll dig in there with Charlie tonight and see what I see as far as brood & other clues. Steve has almost finished building the inner covers so, tonight, Charlie and I will put them on and take another peek in the hives to see if the bees are behaving. Maybe I can convince Steve or Isaac to man the camera this time. Bet your Carniolians are stalked because their queen is spent. Either order or raise another. Bet that’ll fix the problem. Carniolans typically over winter in small numbers. But spring buildup is, also, typically explosive. Thanks, George. What would cause a queen to do that? She’s brand new from last year. Unless she didn’t get mated well initially? But, if she’s failing, wouldn’t the bees know that and raise a new one? Some queens do “run out of steam” sooner than others. Sometimes it is a quality issue. Sometimes they simply didn’t get fertilized enough on their mating flight. And, I’ve noticed that sometimes it takes a while for a hive to take note and replace her. More often, they’ll swarm. Another possible cause for this failure to thrive could be nosema. Thanks, George. There are storms moving in tonight and over the next few days so I’ll do another check after the weather clears. Saw some strange goings on out there today!